Amsterdam places to eat or to grab a snack. cafes and ethnic eateries to luxury Michelin-starred restaurants. lined with excellent budget-friendly Chinese and Asian dining outlets. the end of the queue of locals patiently waiting outside either for their takeaways or for a free seat to materialise. Indonesian food has always been widely popular in the city, so the choice and variety of Indonesian restaurants and snack bars is exhaustive. spot Nieuwmarkt also boasts a range of excellent cafes, fine dining restaurants, Thai and Chinese establishments, as well as a weekly organic food market. If you are looking for an iconic place simply pop into the Hard Rock Cafe where you can sample some fine dishes and an impressive drinks menu. You can choose whether to take in the charming canal views or get immersed in the entertainment flashing across the numerous plasma screens. Those who crave gourmet experiences should not bypass the Blauw van de Wal in the Red light district considered by critics and diners alike to be one of Amsterdam’s finest high-end restaurants. It is only logical that a seaport city will offer visitors a delectable choice of fresh catch. Indeed, fish has been a principal staple in Dutch cuisine since times immemorial. The variety of fish dishes begins with the simple Dutch tradition of eating raw herring by first picking it up by the tail and then letting it slide into your mouth gradually, continues through the traditional fish stew and ends with delicate sushi offers. In between these, you can sample ethnic offers or local seafood platters. Meat lovers must try Bitterballen, crispy, succulent, melt-in-the-mouth minced meatballs that go very well with a pint of local beer. You can sample this traditionally Dutch snack in any restaurant, bar, pub or cafe. If you are craving something more satisfying, do not bypass the hearty stamppot (Stamppotje in Dutch) – a homey mashed potato dish mixed with root vegetables and bacon. The meatless variety would appeal to vegetarians. Other popular local dishes worth trying are pea soup with ham, apple pie and fries with mayonnaise. Besides cannabis treats, local cafes offer fulfilling and affordable grub – sandwiches, salads and a choice of local specialties. Breakfast in the Netherlands is served until 10 am, lunch from 12 pm onwards, while dinner is quite early with most restaurants closing for business at 10 pm. Keep that in mind to avoid disappointments or look out for the few establishments that have longer opening hours. Stay close to the foodie haunts of Amsterdam. Our accommodation offers in areas with a vibrant dining scene such as De Pijp, Nieuwmarkt and China Town will allow you to indulge your taste buds. We have studio apartments with kitchen facilities and holiday apartments outfitted with a full kitchen, utilities, and appliances. These Holiday rentals are ideal for families with children who need to plan meals with fussy kids in mind or anyone who wants to have a kitchen at their disposal during an extended stay. What better way to prepare meals sourced from the mouth-watering delights sold at city’s organic food markets? A great place and very cheap for what you get. All food is cooked right in front of you and is very tasty indeed. All ingredients imported from Italy. As a city, Amsterdam offers travelers many reasons to visit: world-class museums, one of the best preserved historical centers in Europe, playful transport by bike, the freedom of the coffeeshops, the mix of risqué and authenticity in the Red Light District, the list goes on. One list that Amsterdam never tops is that of a food paradise. With the traditional Dutch kitchen more suitable for farmers and the prices at restaurants ranking among some of the most expensive in the European Union, Amsterdam isn’t on the list of many foodies as far as destinations go. But the entrepreneurs behind the massive De Hallen project are looking to change that. With the opening of De Foodhallen in October, Amsterdam welcomes an indoor food court that looks to rival the likes of Chelsea Market in New York, the Borough Market in London, San Miguel in Madrid and even Markthal in neighboring Rotterdam. Taking up a whopping 2,500 of the 16,000 square meter compound, the mix of stands and stalls is massive. Located within the complex simply called De Hallen, De Foodhallen is part of the wider renovation project that has given new life to an abandoned tram depot in the booming Kinkerbuurt in the western part of the city. Along with two restaurants (Halte 3 and Meat West), a movie theater, a hotel, library and many small shops, De Hallen looks to draw both tourists and locals. The idea behind De Foodhallen is to break with the typical restaurant experience; you won’t find the traditional “appetizer, main course, dessert” style menus here. Instead, the spacious layout begs for browsing and selecting a mix of smaller, takeaway dishes from the 21 different stands. And don’t fret at the idea of lingering. A textbook case of adaptive re-use gone right, the building has lots of natural light with a raw industrial feel that manages to remain homey by integrating the original red brick walls. With tables spread out in the middle of the stands, feel free to grab two or three dishes from different vendors and treat your taste buds. A gastronomic tour with cuisines galore! Having 21 stands may at first not seem like a lot if you’re familiar with other food markets and events in Amsterdam, notably the Rolling Kitchens, Taste of Amsterdam and Het Hoofdgerecht. However, what De Foodhallen lacks in sheer quantity, it more than compensates for in diversity and quality. Hand-selected for their contemporary dishes and superior ingredients, De Foodhallen achieves a balance between cuisines, budgets and flavors that will keep you coming back for more. For example, the classic Dutch bitterballen (a type of mashed meat/potato ball that is breaded and fried to perfection) gets an upgrade from status as drunken munchie to handcrafted delicacy at De Ballenbar, while just a few stands further the Green Brothers are cranking out ingenious vegetarian creations. On your way to the table, discover more styles of hummus than you thought possible at Maza. Throw in some of the most delicious Spanish delicatessens from the Jabugo Bar Iberico and Vietnamese finger foods from VietView and you’ve already made a culinary journey from the Netherlands to the Middle East, Spain and Asia. Also not to miss are the Indian dishes from Shirkhan that mimic the street-food style so popular in the vibrant metropolises of Mumbai, Delhi and Bangalore. Looking for something lighter? Grab some sushi from Friska or a frozen yoghurt for dessert from Yogen Früz. Those who are more carnivorous will be delighted by The Rough Kitchen’s savory pulled pork sandwiches and the perfectly cooked cuts of beef at L'Entrecôte Mobile. The problem lies not in a lack of options, but rather in a surplus where your eyes get to big for your stomach and you end up ordering one too many of these appetizing dishes! 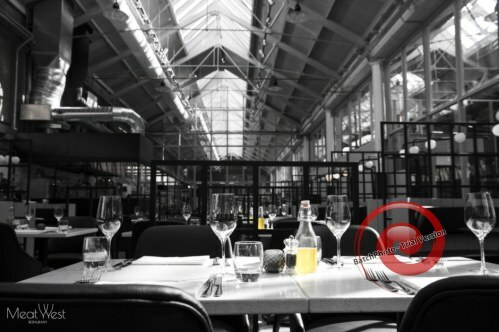 Not only does De Foodhallen offer a great lunch option, but it’s the perfect complex for a creative dinner date or evening with friends. Lacking the formality that’s associated with restaurants, the vibe is very relaxed and perfect for meeting a group after work or grabbing a snack before heading out. If looking to spend an entire evening in west, start with a dinner at De Foodhallen, stroll next door to see the latest Hollywood blockbuster at De Filmhallen and then have a nightcap at the wonderfully roomy onsite bar Remise 47. With the face of the bar open to the square outside, it’s absolutely ideal for relaxing long into a warm night. DJs and delicious fusion drinks are the specialties at Remise and it’s a great balance between cocktail bar and café. Oh, and one of the huge benefits of De Foodhallen that can’t be overlooked are the budget friendly prices, especially for the Dutch capital. With items averaging between 5 and 7 euros each, take two and it’s more than enough for a meal that ends up being cheaper than a single main course at many average restaurants. 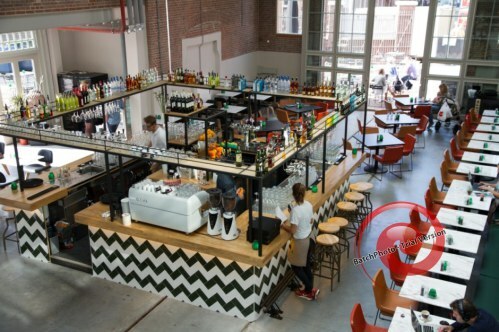 Next time you’re in Amsterdam and looking to break free from the tourist packed center, be sure to give the new foodie Mecca in the west a chance and enjoy a lunch, dinner or drink at De Foodhallen!